When I think of detox I often think of alcoholics and drug addicts going through withdrawals and then detox to clean their bodies. But it’s a fact that detox is useful for all sorts of ailments and to maintain an already healthy system. We are exposed on a daily basis to chemicals, pollutants, foods and medicines which introduce toxins into our bodies. Just living a normal life, even without drinking, using drugs or smoking cigarettes, you can still get big diseases like Cancer and Heart or Liver disease. It’s true that you reduce your susceptibility by living a clean life but I just bet there isn’t anyone on this planet who can live a day without exposure. So this brings to mind the idea of detoxifying the body. You can buy ready made detox products in the health food stores and these are good formulas. However, this is a hit and miss method for many of us. We don’t all need the same herbs and compounds while there are herbs or vitamins that are left out that could be preventative for others. And if you look at the formulas for these products you will most often see Dandelion or Burdock Root. Why on earth would you buy these herbs when they are growing in many yards as weeds? I want to give you some guidelines and list of herbs and weeds you can use for various detox programs and show you how you can either get them for free or for cheap. So here is the list. This is first on my list because it’s just the best thing since sliced cheese! When I was younger and more socially active, I used it all the time. I have always been a lightweight and can only handle a few drinks and an early turn in. But I have friends who can drink WC Fields under the table. So there have been a few late nights with too much liquor. This wonder herb knocks that out and makes you feel good the next day. It is one of the best liver tonics and will clean your system quickly. Scientific research has been done and it actually verifies how well this herb works. It protects Liver cells from free radicals, inhibits production of Leukotrienes and boosts the production of Glutathione. It also alters cells membranes and makes it more difficult for toxins to break in. It stimulates the flow of bile and increases the Liver cell regeneration. So, if you are recovering from alcoholism or have other liver complaints, this is the herb to use. Milk Thistle will grown in your garden so you should buy seeds and plant it. 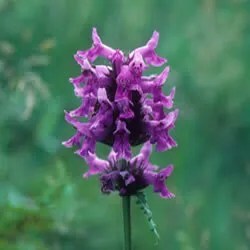 It is also wild in some areas and can be found in fields and roadside lots. Check out the photo and keep it in mind when you’re herb hunting. Otherwise, buy a big bottle of Milk Thistle gel caps and take them every day. Traditionally used for the symptoms of menopause, this herb is loaded with isoflavones that act as a mild form of estrogen. This is a great herb for women who can’t take HRT. However, another great use has arisen for this herb. 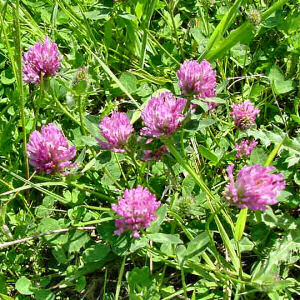 Daily doses of red clover tea will help reduce the symptoms from steroids, radiation, or chemotherapy. So if you’re recovering from Cancer or enduring radiation or chemotherapy, then this drug will help you handle it. It will also help rid the body of steroids so if you have been medicated or using these drugs for body building and are on the mend, then this herb will help your boy recover. It also has mild blood-thinning capabilities, making it useful as a preventative for arteriosclerosis and high cholesterol. Red Clover is the state flower of Vermont so you will find it around the New England area. In other areas it will be hard to find in the wild. You can grow it yourself from seed or buy some flowers in the nursery. You use the flowers and not the leaves or stems. This fantastic herb is really useful in cleaning out the urinary system. Most effective on the bladder, this herb is one of the most effective methods of increasing urine and inhibiting bacteria at the same time. Many detox programs require the use of diuretics to rid the body of excess fluid. If you are recovering from bladder or kidney disease, edema caused by other disorders, stroke from high blood pressure, obesity or kidney problems, this herb will get the water out of your system efficiently. You will not get cystitis or bladder infections from using it, either. If you are suffering with spasms or inflammation as the result of bladder or kidney disorders, this herb will cleanse your system and stop the pain. It is highly effective in ridding the body of excess fluid. This herb is actually a weed that grows wild just about everywhere. It is the state flower of Kentucky and is common throughout the south. 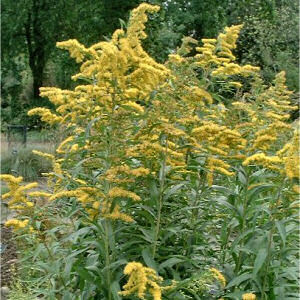 It is the most common allergen among weeds and if you are allergic, you should not use it. You can grow it yourself rather easily and you can use the entire plant. The seeds of these herbs have a special place in your medicine cabinet to cleanse the system when it’s clogged up or not moving. Detox programs often call for a colon cleansing and fasting period to clean the body. With Psyllium or Flax seeds you can get the system moving, clean it out in the process and you won’t have to fast. Buy the powdered seed husks at health food stores and forego the sweetened mixes they sell in the supermarket. The seed husks are most effective at forcing the expulsion of colon contents. Drink lots of water when treating the system with Psyllium. With the low cost and common availability of Psyllium it makes sense to just purchase it as you find it. You won’t find it growing wild and it is difficult to grow. This herb is commonly used to boost energy and memory. It works great for this. But there are other, detoxifying uses for this herb. It is an antioxidant that enhances heart efficiency. It will increase blood supply to the extremities and has a tonic effect on blood vessels. If you are recovering from a heart attack or stroke you can regenerate and detoxify your blood with Gingko. It literally keeps platelets from sticking together. It’s better for you than those expensive medications your drugging yourself with. Over time, it improves greatly the health of blood vessels and is especially useful if artherosclerosis or stroke has effected brain function. Heart surgery often requires the use of blood vessels taken from the legs or arms. Circulation problems result. Gingko will cleanse and tone the arteries and make them move the blood faster. It is also an excellent cleanser for people who have plaque on their arteries. It is a proven blood tonic and overall detoxifier. This is a hard herb to grow so it is suggested you purchase it ready made for ingestion. You won’t find it growing in the woods. A monthly featured Herb a few months back, I’ve talked this herb up before. This is a well known detoxifying herb that has demonstrated anti-tumor effects in animal studies. It also acts as an anti-mutagen. It is highly useful in Cancer treatment and recovery. Traditional Chinese medicine uses this herb as a blood purifier. It stimulates the flow of bile from the Liver and facilitates the digestive processes. If you are taking Chemotherapy, Radiation or are recovering from Cancer treatments, this is the herb for you. It does grow wild all over the world so look at the photo and keep it in mind while you are hunting for herbs in the woods. You can buy it dried at health food stores or make a tincture from fresh herbs you grow yourself. Burdock tea will help with the nausea, loss of appetite and inflammation that follows treatment for Cancer. Well known as a diuretic, Dandelion has been used to flush the system or to help women lose weight. It has a pronounced effect on Edema and will reduce fluid retention rapidly. It can also help with a hangover by ridding the body of toxins and will stimulate the liver, speeding up alcohol metabolism. If you want to sober somebody up pretty quickly, a cold shower will help but Dandelion will finish the job. The root of this plant is also an antioxidant and is rich in Vitamin A. It will help repair damage done to the liver and to the body system. If you are recovering from Liver disease, Bladder or Kidney troubles, Edema, Endemetriosis or are battling High Blood Pressure, this little flower will help you overcome it all. Cleanse the body and regain your balance with Dandelion root. Just look around the neighborhood or even in your own yard. Somebody has a Dandelion growing there. Yank it up and use the root. You can grow it easily. Just plant one taken from the woods in your own yard and watch it multiply. One of God’s little gifts to us. Enjoy it. One of my client is called” purifyyourboby.com” you can call owner of this website to prove my words! a medicine woman offered me red clover and yellow dock roots and to make a tonic in the amount to fill a pepsi bottle and 2 cups a day.it cleans the blood and liver hope this helps. Can you use steep these herbs together? Is there any harm in combining them into one decoction? Most herbs are safe in small combinations but there are some that, when mixed together, create negative effects. Most of those listed in this post are safe and non toxic just don’t overdo it. Does echinacea help detox the body too? Great article! I’m kind of surprised to see echinacea not on the list…. Echinacea is a good antibacterial and antibiotic type property that can help you get over sickness. With Vitamin C, it can help prevent sickness. But detox is not always about sickness. Detox helps cleanse the body and I do not know if Echinacea has cleansing properties, per se. Hello. This is very lovely page. I have also wordpress blogging about garden pharmacy. Very nice job you did. thanks for everyone with you. My health has gradually been getting worse I am 52 years old and am in the process of stopping smoking and drinking. I have always eaten fairly healthy. I eat lots of fruits and vegetables and not too much red meat. Mostly fish and chicken. Which herbs will help me detoxify? I am feeling better already but I know I need to cleanse my body of all the toxins I have ingested for years. Please help me! It sounds like you are making great headway in improving your lifestyle and health. Other than the herbs I outlined in the article, I am afraid I am not well enough informed to guide you further. I am not a doctor. However, many of my readers work in the health field or offer services. Can anyone help Phoebe? You’re right that we can find the herbs our body needs, quite often in the most unlikely places. I think the problem most people face is that they are either too busy or too lazy to figure out what they need, find it, prepare it, and then take it in the right proportions. It’s a lot simpler for most folks to just purchase one of the ready made herbal blends that have all the details ironed out for them. I personally use a detox colon cleanse called Herbal Fiberblend. It has the psyllium (soluble and insoluble fiber) that you mentioned along with 17 different herbs that are great for digestive cleansing and health. It’s important that if you are going to use a prepared mixture that you do some research and be sure that you are getting a quality product made from organic ingredients. I’ve certainly learned a few things reading your article. Thanks for taking the time to lay it all out there. Knowing me, though, I’ll still stick with the ready made product to save me the time and effort, especially since I know it does a good job.